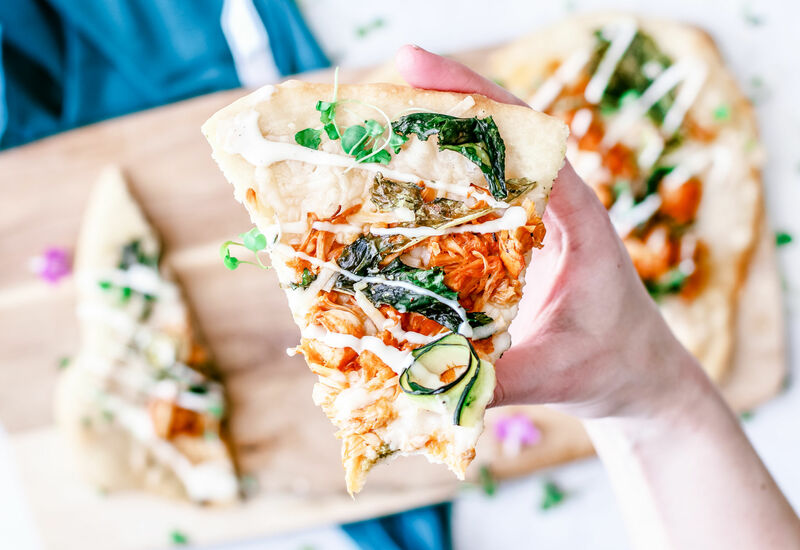 This Vegan Buffalo Jackfruit and Broccoli Rabe Flatbread—complete with an indulgent drizzle of Ranch—does a great job at exposing who I am when it comes to food: experimental and quirky with a handful of nutrition and a splash of indulgence. I’m all about balance. 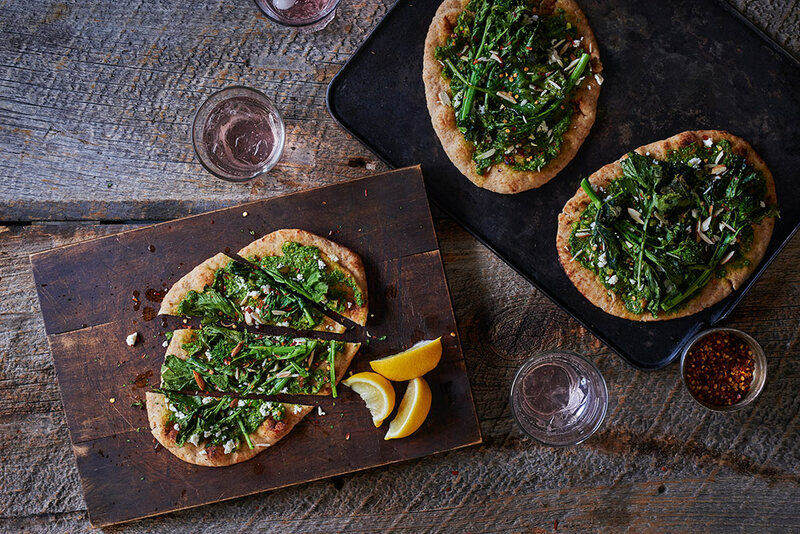 So when I cover my flatbreads with vitamin-packed nutrient-dense things like broccoli rabe, I can totally have my pizza… and eat it, too. 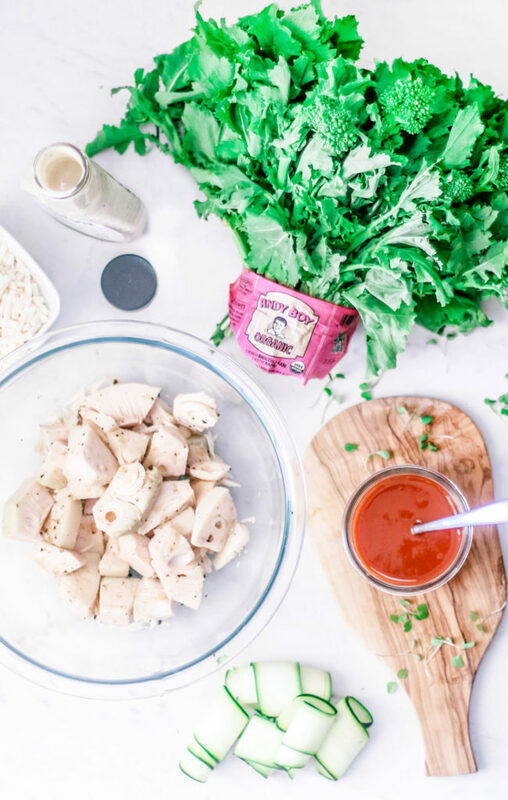 Dana is the author behind Killing Thyme, a pescetarian and vegetarian focused blog where you’ll find a collection of dazzling eats with sustainable ingredients for those looking to phase into a healthier lifestyle with ease. 2. Prepare the jackfruit. Drain, rinse, and thoroughly dry your jackfruit with paper towels. Cut away the center core portion of the fruit (feels rubbery and resembles the core of pineapple). Place the jackfruit in a large bowl and add the garlic powder, onion powder, pepper, and salt. Toss to evenly coat and set aside. 3. Heat a large skillet over moderate heat; add 1-2 Tbsp of oil. Add the seasoned jackfruit and toss to coat in oil; cook for 3-5 minutes until jackfruit is lightly golden in color. 4. Add the Buffalo-style hot sauce. Toss to coat, and bring the heat down to medium-low. Cover and allow to simmer for about 10-15 minutes, stirring occasionally. After 15 minutes, shred the jackfruit with two forks so that the jackfruit resembles pulled meat. Stir, add a bit more hot sauce if needed, and cover. Simmer for 5 minutes on low. Remove from heat and set aside. 5. Prepare the broccoli rabe. Trim the rough ends from the broccoli rabe and roughly chop the rest. Rinse and pat dry with paper towels. 6. 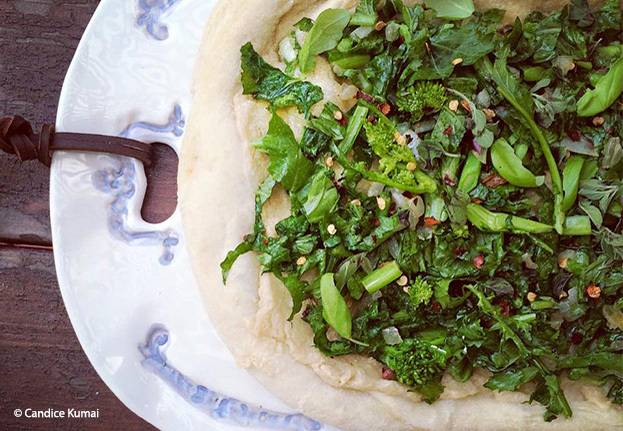 Place the broccoli rabe into a large bowl and drizzle with olive oil. Add the garlic powder, salt, and pepper, and toss with your hands. Massage the oil into the broccoli rabe to properly coat. Set aside. 7. Prepare the flatbread. Brush the large flatbread, or each individual flatbread, with olive oil. 8. Evenly sprinkle the cheese across the flatbreads, and then then top with the pulled Buffalo jackfruit. Proceed with the broccoli rabe and zucchini. 10. 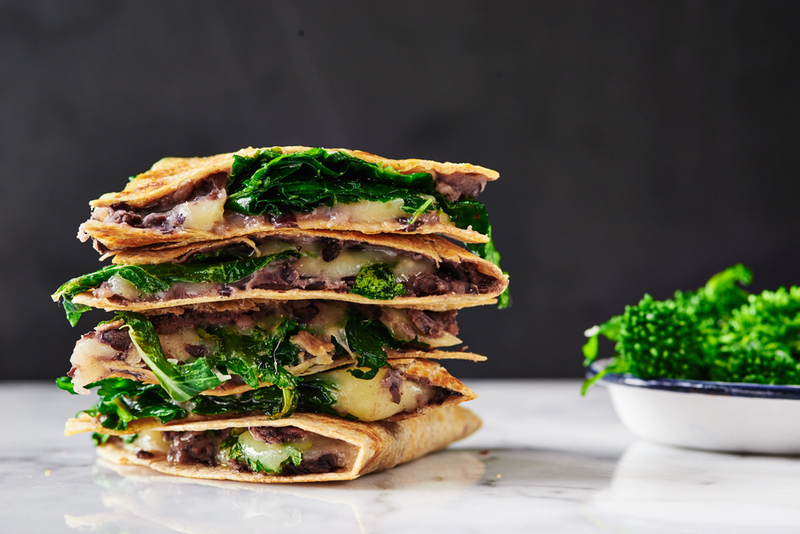 Remove from oven, drizzle with Ranch, garnish with microgreens (optional), and cut into squares if using a large flatbread, wedges if using personal-sized flatbreads. Then serve! 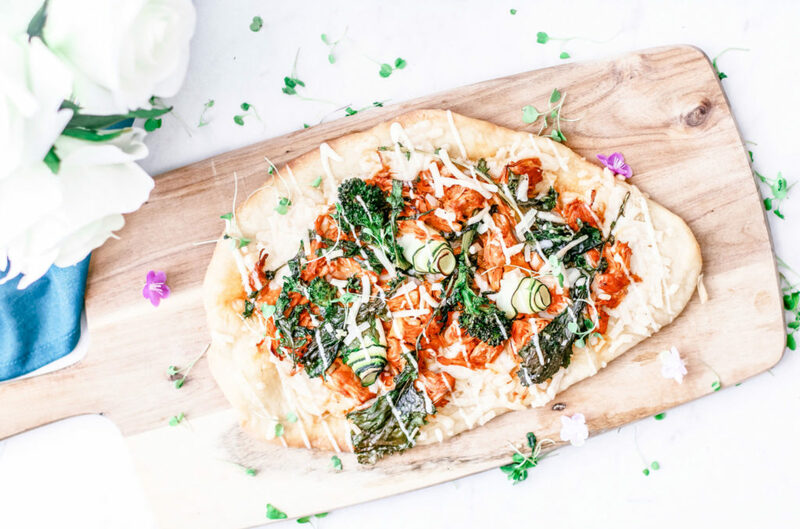 *Working with from-scratch dough: Typically you want to bake from-scratch flatbread at 425° F for 7-15 minutes, or until the dough has crisped and turned golden in color. Always double check with the dough recipe you’re using. 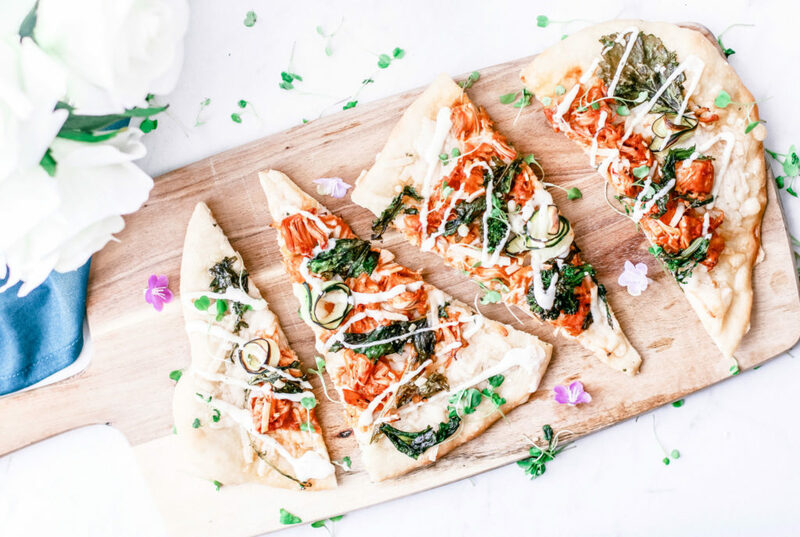 **Prep time: This is based on the use of pre-made flatbreads. 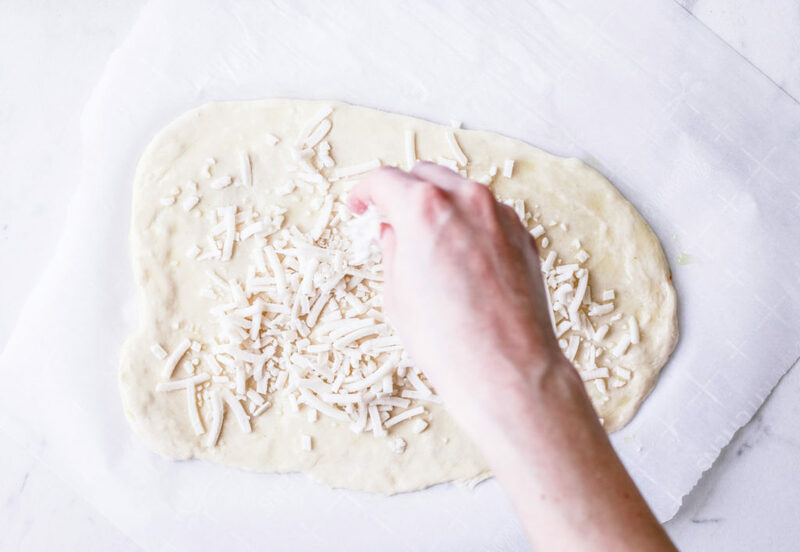 If you’re making your own from-scratch flatbread, prep time will be up to two hours longer, depending on your recipe, in order to let the dough rise. Keep this in mind when planning!